Is a sofa sleeper the same thing as a sofabed? Yes. They are also sometimes called a pull-out sofa bed or pull-out couch. Is it unhealthy to sleep on a sofa bed long term? Sofa beds are not designed to take the place of a standard bed. Not all sofa beds are made the same, so depending on the quality of the sofabed, particularly the mattress, it may be comfortable for a while before you being to feel the ill effects. Many sofa bed frames have a support bar located perpendicular to the length of the bed, which can usually be felt through the mattress, causing a very uncomfortable sleep surface. How can I make my sofa bed mattress more comfortable? 1) Purchase a good quality sofa bed mattress topper. There are different styles of toppers on the market. Some are sized specifically for sofabeds and have corner straps to keep it in place when the bed is closed. 2) Invest in sheets specifically designed for sofa beds. Since sofa beds are not the same size as standard beds, regular bed sheets do not fit well and cause the sheets to bunch up in the sleep surface and sometimes slip off the mattress. 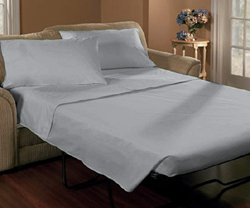 Sheets made for sofabeds stay in place and provide a more restful night’s sleep. What size sofabeds are there? XL Queen (60 x 80) – same size as a conventional standard queen bed. 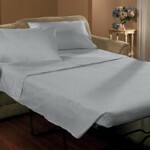 Extra Wide Queen (66 x 80) – same size as the conventional Olympic Queen size bed. King (76 x 80) – same size as a conventional standard king bed. Do I need to use special sheets with my sofa bed? Although some sofa beds are the same size as a conventional bed, the mattress is much thinner in depth than standard mattresses, ranging between 4” and 5” deep. With that, sheets specifically designed for sofa beds are needed for a proper fit. Some furniture stores may carry sofa bed sheets as a complimentary service to new customers, but most times sofa bed sheets are only found in specialty linen stores. Shallow mattresses to fit low profile and platform beds may seem like a new trend, but the fact is, shallow depth mattresses have been around for decades. Before deep mattresses became popular, standard mattresses were typically around eight to ten inches deep and step stools certainly weren’t needed to climb into bed. Beds were easy to make and you didn’t need muscles like Hercules to lift the mattress and tuck the sheets under. Bed sheets were easy to find in department stores. You bought what you liked and they fit well. They weren’t too big or too small. Like Goldilocks would say, they were “just right”. As life goes, nothing stays the same forever, and somewhere in the 1990’s the trend shifted to very deep mattresses, with some as deep as 20” to 22” thick. When they first became popular, finding deep pocket bed sheets to fit these monstrosities was a problem, because bed manufacturers do not consult with bed linen manufacturers before deciding to make a certain size bed. Yes, as crazy as that sounds, it is true. As a result, those who bought the deep mattresses were left searching for sheets to fit, which were found only in specialty linen stores. This is a complaint we hear every day and once again we’re here to help. At Cozytown Linens, we offer fitted sheets in one inch increments starting at 6” deep up to 25” deep, to accommodate both the shallow and deep mattresses. No matter what size mattress you have, we have sheets that fit. And best of all, they are made right here in the USA! In this fast-moving society people often go without enough sleep. It seems that there just is not enough time in the day for the recommended 8-hour sleep. One way to combat the fatigue and sluggishness that result from this deficit is to take a power nap. Power naps are also incredibly beneficial for those who do get the recommended 8 hours of sleep, since the naps can provide the energy needed to be as productive in the latter part of the day as in the beginning. 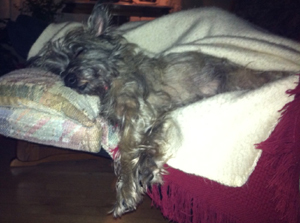 Mercy, our little Toto, taking one of her many power naps. What a life! Power naps can be as short as 20 minutes or as long as 30 minutes, and the benefits differ depending on the length of the nap. The 20 minute power nap which can easily fit into a work break or lunch hour, increases alertness and motor skills. A longer nap of just 30 minutes helps to get creativity flowing and improves memory capabilities. The key to power napping is to keep it between 20 and 30 minutes to avoid falling into a deep stage sleep and waking up groggy. 1) Keep it short:Set your alarm for 30 minutes or less, otherwise you may wake up groggy. 2) Pull the shades if possible: Nap in a dark room or wear an eye mask. 3) Blocking out light helps you to fall asleep faster. 4) On a cool day cover yourself with a light blanket to maintain your body heat. It will also help you to fall asleep faster and rest more peacefully. According to research, taking a 30 minute power nap is more beneficial than sleeping in an extra 30 minutes in the morning. Taking a power nap refreshes and resets the system, boosting energy levels, allowing you to be more productive during the day.